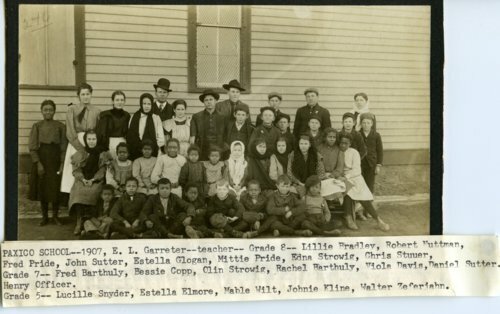 Photograph of school children who attended the old Paxico City School during the 1907 school year. E. L. Garreter is identified as the teacher. Eighth graders are identified as Lillie Bradley, Robert Nuttman, Fred Pride, John Sutter, Estella Glogan, Mittie Pride, Edna Strowig, and Chris Stuuer. Seventh graders are identified as Fred Barthuly, Bessie Copp, Olin Strowig, Rachel Barthuly, Viola Davis, Daniel Sutter, and Henry Officer. Fifth graders are identified as Lucille Snyder, Estella Elmore, Mabel Wilt, Johnie Kline, and Walter Zeferjahn.